When I think of “nutty monkeys” many memories from the past 27 years come floating across my mind. Oh, the stories I could tell! We will also be talking about toys in this post too. 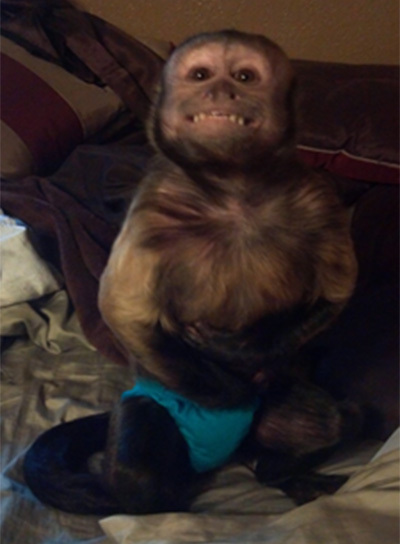 But before we get to some important information about toys, I feel that the rest of the story about Casper from my last posting here on the Primate Care Site, would be the first story to start with for this posting. In the last posting I was talking about adding another monkey into your life. One of the stories that I was telling about was the special little Casper monkey who was from New York City. 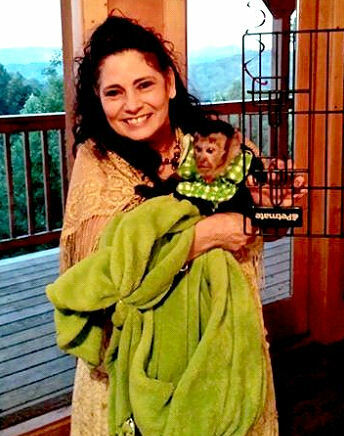 My best friends Danny and Lisa Covington decided to give Casper a chance at adjusting into their life and the life with their monkey, named Tiki, after he failed to adjust well with me or my troop. In the beginning Tiki and Casper adjusted really well when Danny and Lisa took Casper to live with them. Tiki had a new playmate, and that part of the change went mostly very smoothly. Casper had been raised by a family that loved him but had to find a home for him due to life changes. Everything changed so quickly for him. 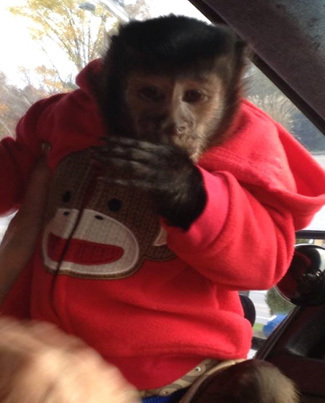 After watching him, it was very apparent that he was dealing with more than just the normal issues of a monkey that was first adjusting to a new home. When Casper had first come to Tennessee, he had come to live with me and he could not be given any freedom time due to his ugly nature towards me but when he went to their home, he was allowed freedom due to his loving and respecting Danny instantly. All of us were so glad that he had bonded with Danny and were even more excited that Tiki and Casper accepted each other so easily. Soon after Casper arrived at their home he started to have the strangest behavior while he was out having play time. He would suddenly make himself very angry and go into having a fit of sorts. None of us had ever seen a monkey do this type of thing before. After a few moments of getting himself really angry he would go over to Lisa and start towards her in his angry mood and act very similar to the way he had acted towards me. He would only choose to do this to Lisa which was not strange to us due to the way he had acted with me. We both just thought that it had to do with him having an attitude problem with women which we both were able to deal with. Lisa so wanted Casper to adjust to her that she was so sweet to him and would begin speaking softly to him and telling him it was okay and to calm down every time he would turn in her direction with his angry look. Because of this behavior she was not being able to bond with him as Danny was able to bond or to be able to change his diaper while Danny was out of the house working. After we all talked about “this nutty monkey behavior,” we all agreed that this behavior was not changing and if anything it was getting worse. He would go from being perfectly normalized in his behavior to making himself so angry and totally out of control. His own thoughts were obviously doing this to him. So, after several weeks we all three decided to talk to our vet about what he thought was happening to Casper. He agreed with us and also felt that the behavior was not a normal type of behavior and decided to do some valuable research for us. However, while he was there we did find out that Casper was in perfect health. In a few days, he called Danny and told us that after doing his research that he thought that Casper was a good candidate to try using the smallest dose of Prozac on him. He then told Danny that several other vets across the country had tried this drug on other primates when they had gone through traumatic changes in their lives and that the results were very positive. Due to the magnitude of Casper’s life changes, he felt that we should carefully consider trying him on this medicine. He also told us that the medicine could take up to a month before it would or could help him normalize his behaviors. The vet said that if we did decide to do this that he would be glad to call the prescription into Walgreen’s for us if and when we decided about doing this. Of course, Lisa and Danny wanted to give Casper a chance at being normalized in their home with them. So, within a few days they started Casper on this drug. He was wonderful about eating it crushed up in his yogurt snack and believe it or not, they noticed within a few short days that Casper was starting to act differently and called our vet to report his progress. At that time the vet decided to up the dose to a full half of a pill. Wow, what a change Casper made. 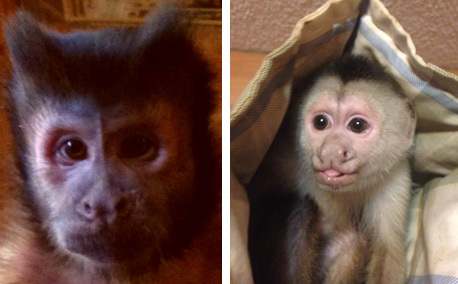 He was like a totally normal monkey within two short weeks of taking the medicine. We were all so amazed and very thankful that he was normalized within such a short time. When Danny called the previous owner of Casper, he was so happy about this transformation too. The medicine had given him just the help that he needed to turn the corner. To me it looked as if he had a form of a nervous condition or a break down of sorts from his sudden life change from New York City to Tennessee. We were all so thankful that the vet had done the research and suggested us try this treatment. The little “nutty acting Casper” was eating well and adjusting more everyday. He started to love Lisa and also loved to be held by her for long periods of time. All of us were so excited for Casper and we enjoyed watching all signs of his previous behavior fade completely away. The end of this story is the very best part though. After 6 months of Casper being so leveled and happy in his new life, Lisa and Danny decided to slowly bring him off of the medicine as they carefully monitored his behavior. Each day they would give him less of the medicine and he continued to be the same normal acting monkey as each dose was lowered. Within ten days he was completely off the medicine and he still was doing great. Evidently, the chemistry had changed in Casper to cause his “nutty monkey” behavior but the medicine worked great to change the chemistry back to normal and once it did he was able to live normal without the drug. I do not feel that this type of medicine is a quick fix for all problems for every monkey but for little Casper it really helped him very quickly become the perfect addition to their family. He plays ball with Danny and he loves to tell on Tiki for trying to steal his food while Lisa watches with a smile on her face. One of his methods of tatter-telling is screaming his head off. There was a time that she was not sure Casper would be able to stay with them but now she would not trade him for any other monkey. Yes, we have the best ending to this story that is possible. Casper found a new forever family. Lisa with Tiki (age 9) and Casper (age 7) – these two monks never stay still for a photo! Down through the years I have heard of others speak of putting “their nutty monkeys” on this type of medicine that we have just spoken about but this was the first time that I had personally seen how it can work when it truly is needed to transform a monkeys traumatic life experiences. Casper’s emotional issues needed to be addressed with our vet. We are all so glad that the outcome of our decisions was so positive and the picture above was possible to be taken with all of them together. I have always been so thankful that I chose the right couple to work with Casper. He is a very strong willed monkey but has monkey caregivers that will keep working with him as he continues to grow and go through the stages of his life. Let me caution you once again about using medicine to try and alter monkey’s behaviors. This is not a common practice that veterinarians across the country will choose to use automatically. This is only used with severe emotional issues. Just as with all medicines, your vet must do the research about your specific problem with your monkey. As I always suggest, please give yourself time to listen for peace to guide you with your big or little decisions. Putting a monkey on any type of regular medicine is a very serious thing especially a drug like the one that was used on Casper. Silly Willy has never been very silly in his life but he has turned out to be “yet another nutty monkey,” with a terrible habit that has almost driven me crazy! It is normal for a baby monkey to quickly put everything they see into their mouths from the first day they come to you. But to Silly Willy it became his second favorite thing to do. He loves his thumb beyond words but when he is not sucking that thing he is looking for something to be chewing on. He has been taken to the vet twice to gas him down so the vet could remove plastic that had been in-bedded deep into the gum. He must take medicine to calm his throat and esophagus area after he eats something like strings or plastic and begins his attempted to cough or through it up. He is definitely a “Nutty” monkey. After realizing that he is going to keep doing the same thing over and over again, I decided that I had to be the smarter one and do something about his plastic toys. I knew that Lisa had to do the same thing with Tiki and his toys but I never thought that I would have to take all of Silly Willy’s toys out of his cage and play areas. I truly knew I had to do something after the second trip to the vet to take the plastic out from his gums but I must say it was extremely hard for me to take all of his toys away from him. He loved to chew his toys. No, he did not like to play with them but he certainly loved to chew them up. I wrote in the book “Living With Monkeys” all about making changes when things happen that we do not like in their behaviors in order to keep it from becoming a habit. This habit gave me feelings of great sadness to know that he had to loose his toys which he dearly loved. I had never ever had such “a nutty monkey” that they became a complete chewer of everything that they came in contact with! Silly Willy Chewing His Girlfriend (Tululla’s Crown). He was (18 months old) in this photo. 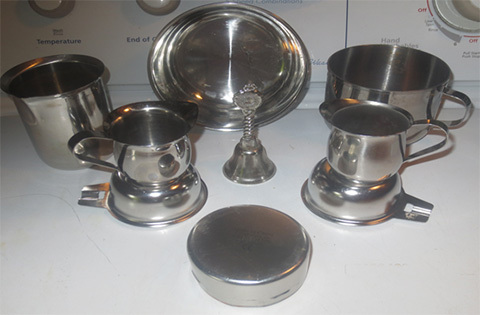 So, the only thing to do was to switch his toys to nothing but stainless steel type of toys. He no longer would be able to have colorful cute little toys or even some types of blankets. 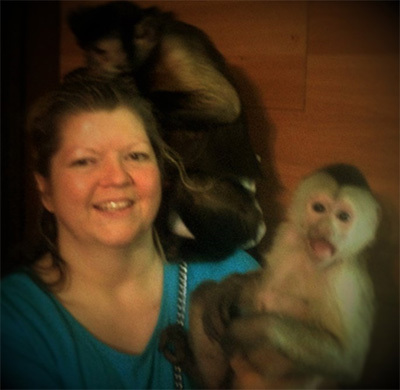 He was a “nutty monkey” and the truth had to set me free to be a better monkey caregiver. I dreamed he would stop being a chewer when he grew up but it just did not happen that way for Silly Willy. The photo below will show you what some of the toys look that he enjoys playing with look like. He plays with these toys just as he had done with his other more common types of colorful toys that were made for kids from chewable plastic. These toys have just popped up while Lisa and I have been thrift store shopping, I can not take credit for the creative nature of these toys. Lisa had started selecting these types of things for Tiki (Silly Willy’s half brother that is the same age) prior to me so she was a big help in teaching me what to choose. I hope that the photo will be helpful to those of you who are concerned about the amount of plastic your monkey is consuming. The blankets that I select for Silly Willy must have all of the heavy trim thread taken from around them. Most of the time, I take the time to pull it by cutting the heavy thread and then pulling the thread from around the blanket but if I am in a hurry I will cut it off with a good pair of scissors. The problem is that it is really hard on the blades of our scissors to do the cutting of these threads off of the blankets. If you have a very mouthy monkey that does these type of things, please do not do what I did with my precious Silly Willy. We all have to face what is going on with out monkeys and do something about the problems. It is always better to do this sooner than later. So, here we go to our famous Primate Care Site List. This list is a list of toys that you might consider using with your monkey as they are cutting new teeth during their (Toddler-Hood) years. 1. 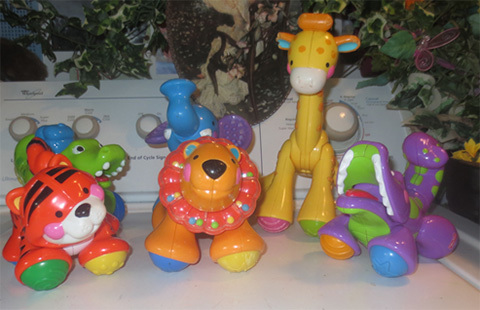 Little Tikes Jointed Toys – the movement of the legs and and necks on these toys is great for them to use. There are some areas that they can chew but they are mostly safe and the plastic is a hard type of plastic. 2. 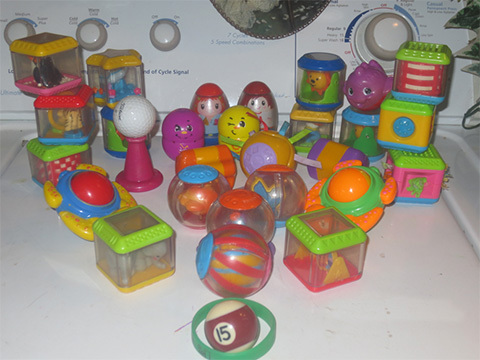 Fisher Price Plastic Block and Ball Toys – these toys are always grabbed up by me whenever I find them. For some of the balls there are ways of moving parts of them, and with the balls they cannot get their teeth around then to chew, The blocks do have ways to chew them but only monkeys like Willy would be able or even wish to chew them up. I am just now adding pool balls and golf balls to Silly Willy’s safe toy list. 3. Vtech Toys – are great and made of heavy plastic. I must always look at them with chewing monks in mind before I purchase one of them. 4. 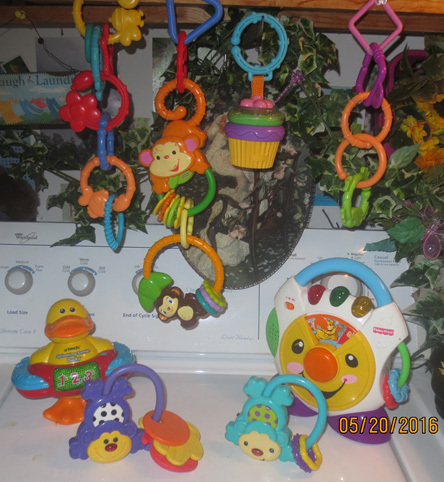 Musical Toys – I love these types of toys for the monkeys because I know when they start playing that they are enjoying them, I like to put then up on the cage very low to the floor of the cage with plastic chain links. I do this so they will not fall upon the monks that might be visiting my other monkeys. When they are playing, the toys can drop from their position with the chain links. I am always looking for the accident potential of every toy placement, size, shape, and with the musical toys that are battery operated, I make sure that the compartment is always secured tightly. Batteries are not a safe thing to allow our monkeys to ever have. 6. Stuffed Toys – There are so many of these different manufacturers and many of them are made with little balls to weight the bottom of the toys down. These should not be placed in a monkey cage when they begin to chew on things. The eyes on these different type of stuffed animals always need to be checked also before we give them to our monkeys. Many people will give them stuffy type animals so that they may be entertained as they are taking them apart. I do not think this is very wise to do. The inside of all stuffed animals is a material that does not need to go into our monks stomachs and they are always very hard to clean them up. We would all like to think we do not need to worry about what fibers that they get into will hurt them but it is just good to keep things simple and safe for them. Many monkeys have lost their lives to toys that were placed wrongly in their cages or fibers that blocked their monkeys intestinal track. So please remember how precious these creatures of God’s are to us and use common sense when you build your monkeys play areas. 6. Magnets – It just kills me to tell you that these types of fun toys for the monkeys are not safe, especially for chewers. When I started giving these to my monkeys I was so glad to have something that was safe, cheap and fun for them to play with. Then I pulled a magnet from Tike’s cage when he was visiting me that he had chewed in half. I did not know at that time how really dangerous it was for the monkeys but I did begin to take then away from the monkeys. The broken piece of the magnet was much to small for the monkeys to have. Several months later another very good friend told me how dangerous it was to have one of the monks to swallow a piece of a magnet. The research about this that I read is that they will cause serious damage to their gastric track and will not pass as other things might and surgery will need to be done most of the time, for children and that means monkeys too. 7. How We Position And How We Put Things In The Monks Play Areas or Cages – Many times when I am on Face-book and I see things in others rooms or cages that I feel are un-safe for their monkeys, I will private message them about this. But many times I will choose not to do this. I always listen for peace to guide me not out of fear but out of peace. Many people will have cage accidents with their monkeys when they are young. Some are so weird that I cannot even believe it happened as it did. After having one of my star-performing monkeys have a travel cage accident I went the next day and ordered different types of cages. I had traveled for years with this type of cage in my motor home never knowing that an accident of this type could even happen. At first after his accident I blamed myself for the accident that took his life but I truly did not know that an accident like he had could even happen. This was when I had to begin living with the understanding that I must always look, watch, and try to make sure the monkeys toys, hanging things, and their blankets are safely placed. My lessons were hard in learning how to be a successsful monkey caregiver. I put more importantce on keeping my monkeys safe than I did on learning the truth. If it is their time to pass, I am not in control of this no matter how it might happen. The Creator is always in control of when their time for passing is right. In learning and accepting this I am able to get back to a peaceful place much more quickly when one of my beloved ones (hairy ones or non hairy ones) does pass away. After the first loss of my special monkey Becky, I had a very hard time in moving forward. I had to learn that love is always returned but we must move forward to allow this to manifest in our lives. Please enjoy your monkeys every moment of every day and do the best that you can to keep them safe but please do not walk away from them in fear. If something happens to them you know that you did the best that you could at keeping them safe and that they belong to the Creator first. Please seriously consider leaving them wrapped in love and the hands of the voice of peace. May we also suggest that you choose to take some time to read all of the 12 posts under “Safety-First” here on the Primate Care Site. The information on these posts is invaluable for you to have and to talk over with your family members. The List’s on these helpful post will always be here if and when you might need them to help you with an emergency. Choose to be the very best Monkey Caregiver that you can be. Thank you for visiting us here at Primate Care. We are committed to bringing good information for you to think about and share with your family, friends, and other monkey caregivers. 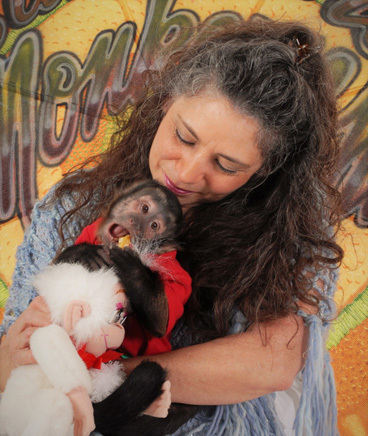 In the next posting on the Primate Care Site we will be speaking once again about “Living With “Nutty Monkeys.” Maybe Opie will allow us to talk about her in this next posting.